After learning “How to use Supertrend” in the previous lesson, this lesson will focus on trading strategies combining Supertrend with other indicators. In this strategy we combine Supertrend with RSI for intraday as well as positional trades. 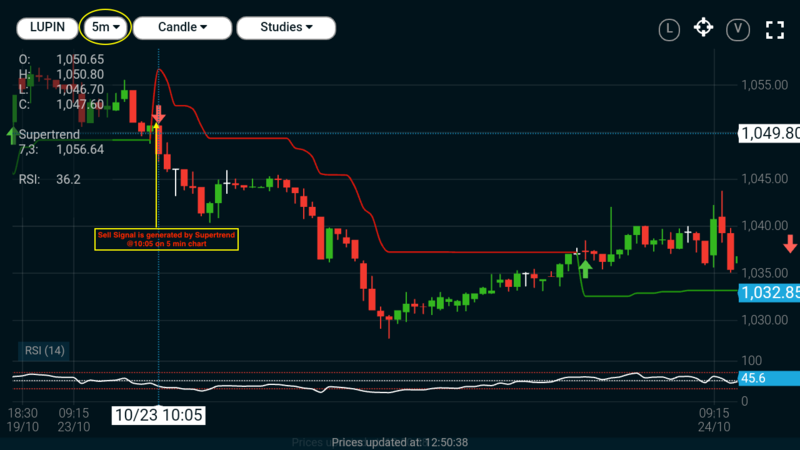 Supertrend is plotted on a 5 min chart and once a signal is generated by supertrend it needs to be confirmed with the RSI level on a 1 hour chart. Thus, Supertrend & RSI are viewed on different time frame charts. In the above 5 min chart, a sell signal is generated by supertrend at 10:05 on 23/10/2017. To confirm the bearish trend we check the RSI level on 1 hour chart. The Sell signal gets confirmed as RSI level is below 50 (at 29.9) at 10 am candle on 23/10/2017. As seen in the chart, sell signal is followed with a sharp fall in the stock prices giving a profitable trade. This strategy comprises of Exponential Moving Average (EMA) & Supertrend. The EMA acts as a base line and Supertrend acts as a signal generator. Note the movement of prices above or below the EMA line. EMA is above the stock price & the Supertrend line. EMA is below the stock price & the Supertrend line. Tip - When a signal is generated, there should be some distance between the EMA and the Supertrend. Avoid trading when the two indicator lines are too close to each other. This is a combination strategy of Supertrend & Parabolic SAR. PSAR is a popular indicator used by many traders to determine the future short-term momentum. It is plotted on a chart as white dotted line. When PSAR is placed below the price, it indicates upward trend and when placed above the price reflects downtrend. Tip - Exit when PSAR gives an opposite signal. Do not wait for supertrend to give an exit signal. 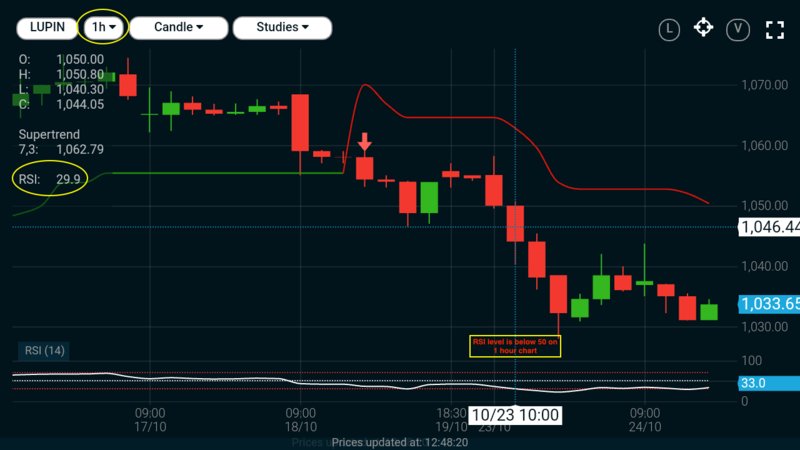 In the above 15 min chart of Crude Oil, as per the rules of the SuperSAR strategy, we enter when both Supertrend & PSAR give the same BUY signal at B1 around 3400 level. This position is maintained till PSAR moves above the price giving an exit (SELL) signal at S1 around 3430 level. Thus it leads to a profitable trade of Rs 30. Another combined entry signal from both indicators is at S2, however very soon PSAR goes below the price giving an exit signal. Thus, the trade gives a very marginal profit. The third entry signal to Buy at B3 is a very strong signal as the prices rally from 3440 level to 3500. This trade is exited at S3, when PSAR (dotted line) crosses & goes above the price.